Trapped In A Fossil: Remnants Of A 46-Million-Year-Old Meal Chemical compounds discovered in a mosquito fossil from Montana offer scientists clues to what the very old insect ate before it died. The bug's final blood meal was likely from a bird, researchers say, and could lead to other hints about ancient Earth. 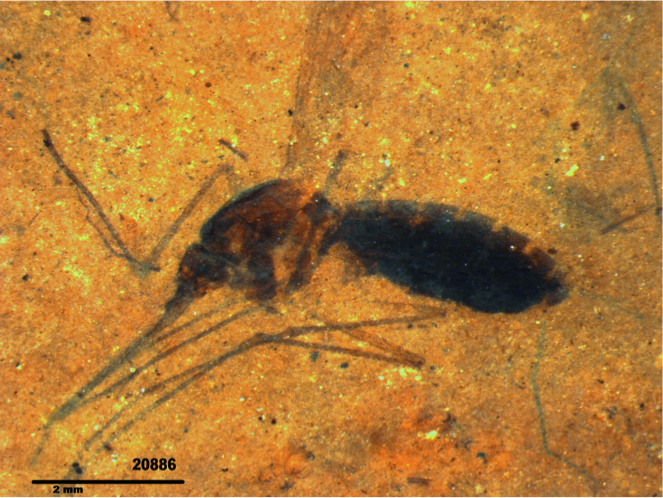 A very old squished mosquito found in fossilized rock from Montana. Analysis of the insect's gut revealed telltale chemicals found in blood. Scientists who study why species vanish are increasingly looking for ancient DNA. They find it easily enough in the movies; remember the mosquito blood in Jurassic Park that contained dinosaur DNA from the bug's last bite? But in real life, scientists haven't turned up multi-million-year-old DNA in any useable form. Fortunately, a team at the Smithsonian Institution has now found something unique in a 46-million-year-old, fossilized mosquito — not DNA, but the chemical remains of the insect's last bloody meal. They started with a fossilized mosquito. If you think it's incredibly rare for a dinosaur to die and get fossilized for millions of years, imagine what it's like for a bug. Dale Greenwalt has. 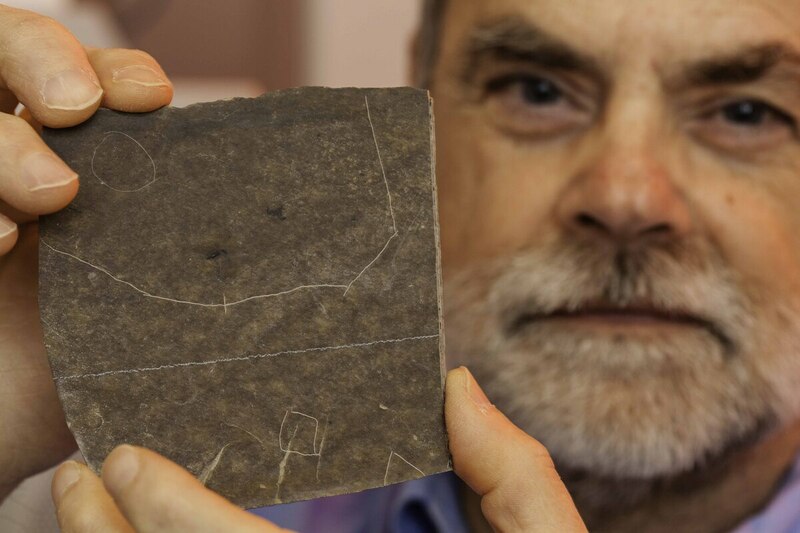 "Everything has to go exactly right to become fossilized," the retired biochemist explains. Everything did go right in a little corner of Montana millions years ago. There's a rock formation there — mostly shale — that's a veritable bug cemetery. Greenwalt collects fossils there, as a Smithsonian volunteer. He spends weeks along a stream examining pieces of shale with a handheld lens, then hauls the loot back to the Smithsonian for more microscopic study. How the bugs ended up in the shale, he says, is a process that only happened rarely. Millions of years ago, a mosquito, say, might land on a gooey mat of algae and microbes, floating on a pond. The mosquito gets stuck in the muck and dies. And then, Greenwalt says, "The algae and the microbes actually grow up and around and encase and envelope the insect." That entombment protects the bug's corpse. The mat eventually sinks to the bottom of the pond. As sediment slowly covers it and becomes rock, the bug's impression is preserved in stone. 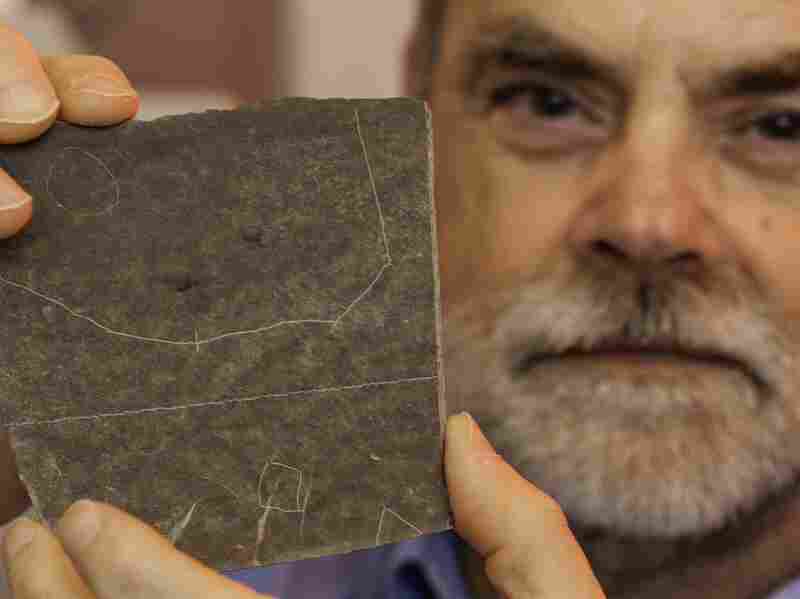 What Greenwalt and a team from the Smithsonian Institution's Museum of Natural History have discovered in one of those impressions is iron — a lot of it — as well as chemical compounds called porphyrins. They're found in what had been the mosquito's abdomen, and nowhere else in the impression. Nor are these compounds in the surrounding rock. The tiny cache of iron and porphyrins was preserved inside the mosquito fossil for 46 million years. "It was exciting," Greenwalt says, "and everyone was jumping up and down because we knew this was exceedingly rare and important." 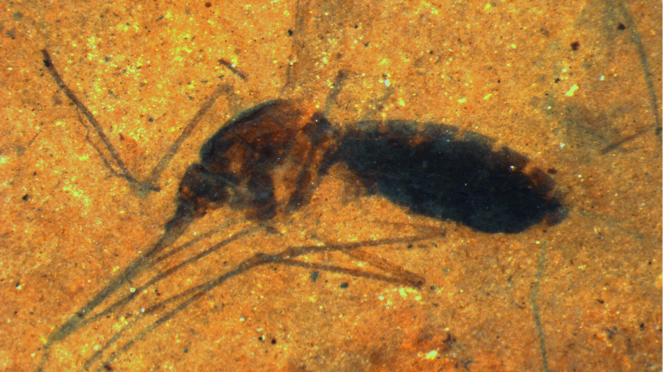 Fossil mosquitoes collected by Dale Greenwalt, a volunteer research collaborator at the Smithsonian National Museum of Natural History.The fossils were collected as part of a 5-year project to produce a research collection of fossil insects from the Kishenehn Formation. They were jumping up and down because iron and porphyrins are the brick and mortar of hemoglobin, the substance that carries oxygen in blood. What they had were the remains of the mosquito's last blood meal. Given the species of mosquito (something Greenwalt could tell from its shape), Greenwalt guesses that its last meal came from a bird; it's a species that preys on birds nowadays. He says the research is important because it demonstrates a technique that could turn up other chemical clues to ancient life. The team describes the discovery in this week's Proceedings of the National Academy of Sciences. Greenwalt says it was the Smithsonian's high-tech spectroscopy equipment — which can detect tiny amounts of any element — that made this possible. It's the kind of hardware you don't find in most paleontology labs. The team plans to try their equipment out on more bugs. "We have fossil insects that are bright yellow, bright red [and] bright orange ... probably a whole array of different types of pigments," Greenwalt says. "I've got the next ten years of my life all planned out working at the museum." Considering that Greenwalt is a volunteer at the Museum of Natural History — he's been retired from a career as a biochemist for years — that looks like a pretty good deal for the Smithsonian ... and for bug history.